The Susquehanna Riverlands is the ribbon of scenic and historic landscape along both shores of the Susquehanna River as it flows through the heart of our Pennsylvania Heritage Area in York and Lancaster Counties, including the historic and vibrant river towns of Columbia, Marietta and Wrightsville. To advance our vision for the Susquehanna Riverlands as a national destination for outdoor fun and cultural discovery, Susquehanna Heritage works with local, state and national partners to enhance this rich landscape by conserving land, creating parks and trails, preserving historic sites, and developing maps, guides, websites and interpretive exhibits to guide and inform local residents and visitors. After more than a decade of investment in heritage and outdoor places and experiences in the Susquehanna Riverlands, we invite you to join us and our partners for fun and learning on and along the river. Visit historic sites, hike, bike and paddle the river, enjoy local restaurants, wineries and breweries, be inspired at art galleries, and immerse yourself in all the Susquehanna Riverlands has to offer. Discover more about what to do, see and experience in the Susquehanna Riverlands! 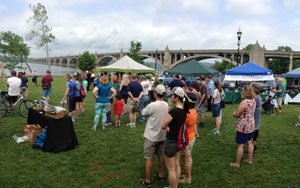 Susquehanna Heritage’s tourism and placemaking efforts along the river are coordinated with the Susquehanna Riverlands Conservation Landscape. This collaboration of communities, organizations and agencies seeks to enhance this rich landscape through increased land protection, natural and cultural resource stewardship, increased public connection to these resources, and promoting sustainable economic development through heritage and outdoor tourism. The Susquehanna Riverlands Conservation Landscape is one of seven such programs across Pennsylvania. They are regional initiatives where partners work together to drive strategic investment and actions around sustainability, conservation, community revitalization, and recreational projects. These large landscape areas possess strong natural assets, local readiness and buy-in, and state-level investment support. Learn more about the Susquehanna Riverlands Conservation Landscape. Learn more about Conservation Landscapes across Pennsylvania. As projects and planning progress, additional organizations, businesses, local governments, agencies, and others become involved as needed.